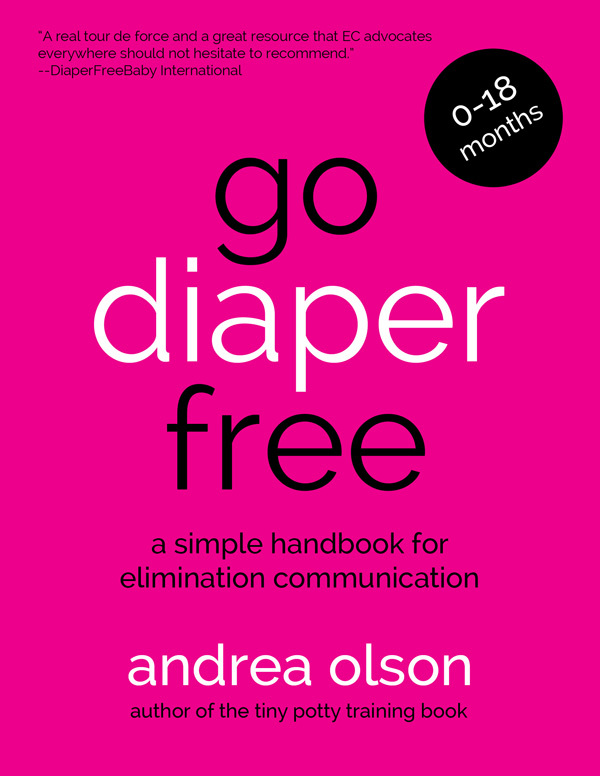 Elimination Communication is the ancient and natural way of responding to your baby’s needs to eliminate that honors her instincts to not soil herself, her caretaker, or her sleep space. It is a gentle and non-coercive method that involves learning your baby’s natural timing and instinctual signals that he needs to potty and then helping him to eliminate in a hygienic place. Most Western practicers of EC use diapers as a back up only so it reduces exclusive dependence on diapers. Babies who are EC’d learn early on that the proper place to put their waste is not in a diaper, but a potty. Most will reach potty independence before the age of mainstream potty training. You can begin EC as early as birth, all the way to 18 months. If you missed this window, you can potty-train your young toddler using a gentle, non-coercive potty training method based on the principles of EC. EC can be practiced full-time, part-time, day and night, with stay-at-home parents, daycare, and other caregivers. Practicing EC can help you stay in tune with your baby, change fewer diapers, reduce diaper rash, lessen your environmental impact, and complement other attachment parenting principles. It will help your baby stay cleaner and drier, maintain bodily awareness, and master potty learning sooner. Order your copy here and use the coupon code GDFGREATERAUSTIN for a 15% discount. Jamie Crouse Gwynn is a Go Diaper Free Coach serving the greater Austin area. She is the mother of two boys, both of whom she EC’d from birth, wrapping up around 20 months. She became interested in EC shortly before the birth of her first child since it seemed to promise an alternative to the potty-training battles of late toddlerhood that so many other parents struggled through. It also corresponded well with a fledgling but instinctual approach to parenting that included being closely bonded to her baby and responding gently to all of his needs in the most natural, primal ways. She is excited to help other parents explore the joy (and occasional frustration) of responding to their baby’s elimination needs and is on a mission to save the world from poopy diapers.